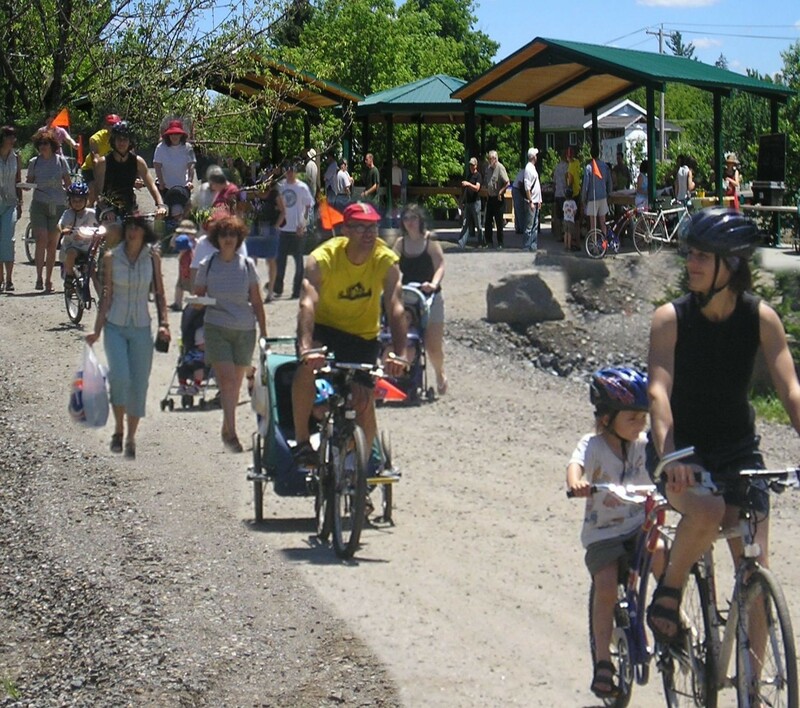 The summer of 2006 marked the grand opening of the Knowlton Public Market and the local Saturday market, nestled beneath the trees on a lovely lot in Knowlton near Flannigans General Store, was a huge success. Residents and visitors enjoyed the weekend chance to purchase fresh produce and goodies in the atmosphere that makes urban markets likes the Atwater Market such a great place to visit. 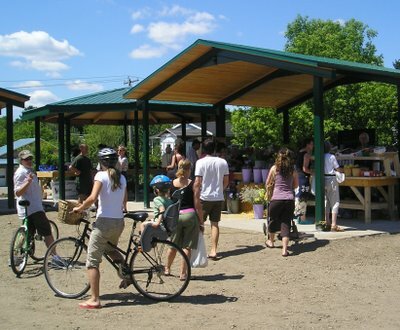 With the 2007 edition of the market set to open on June 16th Knowlton is proud to have such a market in town as the ambiance of the market is wonderful for locals and visitors alike ! In the first year alone over 7,000 baskets of fresh produce were sold and much of the products offered were from local growers working hard in the Eastern Townships. At the end of the 2006 season the operators of the market introduced Quebec Lamb from the Hallacres Farm of Iron Hill and Beef from the Badger Farm of Bolton West. The market happens weekly under the swaying trees off of Maple Street . 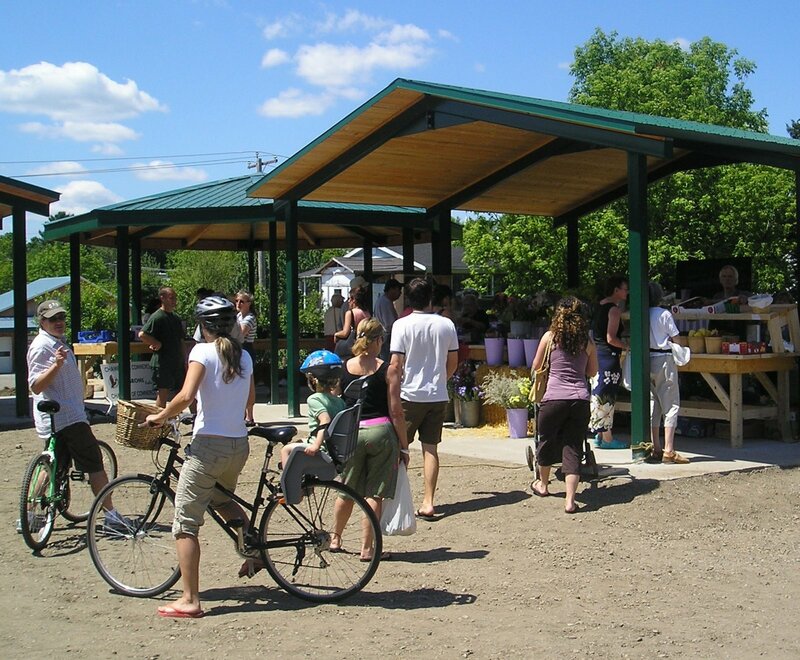 Due to the enormous public popularity of the market the organizers of the Knowlton Public Market, lead by the enthusiastic Henri Laban, they built extra covered table space in order to create more vendor space to offer even more variety. Last years collection of fresh vegetables, baked goods and hot specialty coffees were such a welcome addition to the Knowlton summer landscape that this years additions will likely create an even better atmosphere ! Les lapins de Johanne Gaudreau from the Ville de lac-brome, Les produits dérivés des pommes des Vergers petits fruits Léger from Cowansville, and Fromages canadiens de Fritz Kaiser from Noyan. Such variety is sure to appeal to all manner of culinary interest and to have such a collection of quality local products gathered together is surely a sign of the importance of Knowlton and the Market as a favorite destination for families and all lovers of the finer things in life! 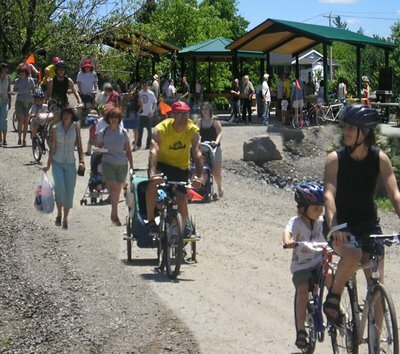 According to organizers the market saw an average of 520 visitors every Saturday at the Market, arriving on foot, by bicycle or by car. The location of the market makes it a lovely walk from most of our homes or from the local hotels and B&B’s by guests who visit Knowlton. What could be better than buying the fresh ingredients for a picnic right in a bustling marketplace at an affordable price! Surveys of the visitors in 2006 showed that 45% came from the Brome Lake Region, 45% came from outside our boundaries and 10% were from the USA. 33% of visitors to the Market met friends or people they knew and surely the other 67% made new friends…that’s the way Knowlton works !! If the sunshine can show her magnificent face for the Saturday market then we will likely see an even greater success this year !